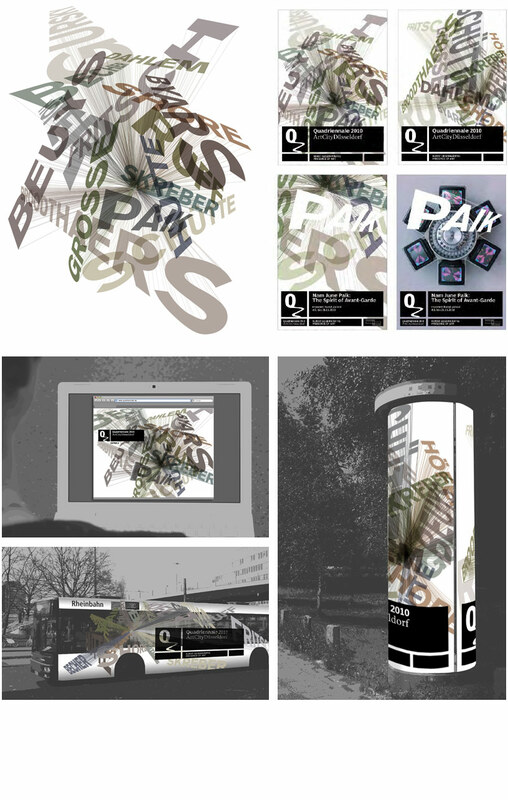 This concept was developed for the Quadriennale 2010, a huge exhibition in Düsseldorf, which is showing work of artists that are somehow related to the city. The base is a typographic illustration existing of the names of all artists that are taking part. These are placed around one center which shall symbolize Düsseldorf as the "source" or "origin". The illustration seems to be constantly moving by showing different details, it is very vivid, ideal for animation, can focus on one artist as well as showing an overview and can be easily combined with the artists photographs. Developed with and for nowakteufelknyrim, Düsseldorf.